Behold this power, for it stands as the manifestation of my raison d’être. And so begins a grand epic of intertwining destinies; a tale of God, of angels, demons and humans living amongst the walls of the floating purgatory, Tokyo Babel — a soaring bastion erected in the image of Tokyo, one of the largest cities of a world succumbed to the apocalypse. What drives its few survivors onward to the gates of Heaven in a world ravaged and bereft of God? And what exactly is this Heaven, for that matter? What aspirations could the angels and demons harbor in an era where the gates of both Heaven and Hell are shut tight even to them? What plans does God have for his flock? Whence should mankind seek guidance with their Lord silent? What choices still await them? The gates of Heaven are closed shut; the realm of Hell consumed by flood. And in their wake, countless parallel worlds wither away, one after the other. 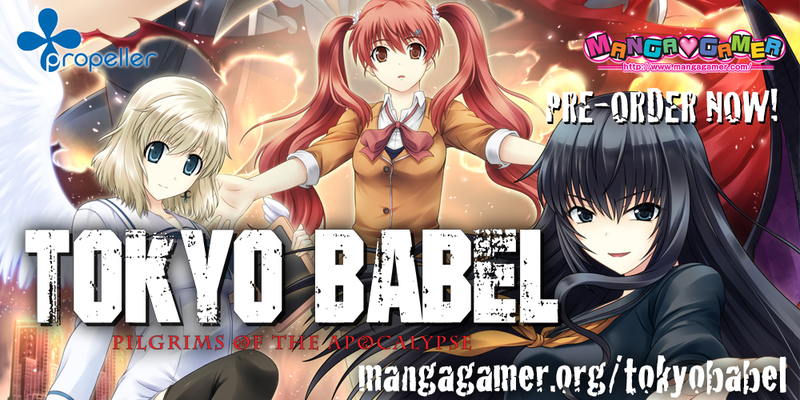 The surviving angels and demons gather at the city they believe to be their final chance at salvation: the floating purgatory of “Tokyo Babel”. Joined by humans, they embark on a pilgrimage across the seven layers of Babel, hoping to ascend Jacob’s Ladder in an effort to re-open the gates of Heaven. Their journey would be an atonement toward the heavens. And yet, their plans fall into ruin as a group of pilgrims ? their minds consumed by madness – set out to lord over the numerous layers of Tokyo Babel with the intention to wreak complete and utter havoc atop the floating purgatory. Amidst this neverending impasse, a lone youth is saved from the ruins of his devastated world – Tendou Setsuna, a man denied human treatment since birth. …yearning for an answer to a single question: Why he still possesses the will to keep on living. « Beat Blades Haruka Now On Sale! Are there any plans to release a demo? Cool, it’s coming even faster than I thought. I’ll definitely buy this one, but since Steam keys aren’t offered anymore, I’m probably going for the Steam version instead. Except then Steam gets of a cut of your money… So why not just buy it directly?